If you’re a heavy tab user, pay attention. With Chrome 9 or later, you can activate a really cool hidden feature called “Tab Overview” that works great with Mac multi-touch devices. The name Tab Overview doesn’t really describe much of anything, but the behavior of Tab Overview is basically like Mac OS X’s Expose but for your Chrome tabs. Relaunch Chrome and open a few tabs, then use a three-finger swipe down on your multitouch trackpad or mouse to activate the Expose-like tab overview. Does not work for me with iMac and touch mouse. Anybody made it work yet? Works great on my iMac with trackpad! duh. three-fingers-down is cmd+w in my macro (and three-fingers-up is cmd+t). why no keyboard shortcut for this? osxdaily, i’ve liked you all along, but now i’m beginning to love you. Have a magic mouse and a mid 2010 27″ iMac and could not get it to work. I blame my fat fingers. It’s hard to get all three on my mouse at the same time. Hey to those say it don’t work. You need to press ⌃⌘T to see Overview Mode after you’ve enabled it in the Settings. It works even if you don’t have an Apple Trackpad or Multi-Touch. Joki, you rock. Thank you for sharing this keyboard shortcut. It should be included in the main article. 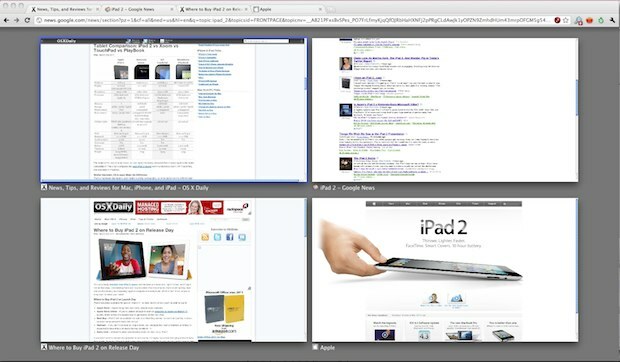 So I bound four-finger-swipe-down to ctrl-cmd-T – so I can swipe down on my magic mouse to expose all the tabs in Chrome. Wonderful! I did the exact same thing. I wasn’t able to get the chrome gesture to work (probably have a conflict with another gesture setting). Better Touch Tool is wonderful. Thanks Joki, you’re great! This shortcut is all I needed, I use iMac with Wacom Bamboo tablet which doesn’t support three fingers down. In May 2016, I can’t find this option in the list of experiments.